From the inception of internet banking to biometrics and beyond - the fintech has undoubtedly been prolific regarding the introduction of new technologies to make the processes simpler and cost-effective. While analyzing the impact of fintech, one may be certain that the next decade will be a decisive point in the war between legacy and innovation. The investment figures suggest that the interest in the niche is indeed high, but we would risk saying that it is only a drop in the ocean. If a blockchain startup manages attract as many as a million customers, it will be a grand success for the majority of the market. However, industry giants won't even notice it. JPMorgan Chase with $23.5 trillion worth of deposit assets won't even be bothered to look down. Santander with more than 100 million global clients will feel from little to no pressure as well. However, we are in a position to see how fintech is driving innovation in the industry. Slowly, but even legacy banks become interested in acquiring promising technologies and implementing them within their structure. Visa, for example, has paid $250 million to acquire Earthport, a startup that provides cross-border payments. Has Fintech Started Replacing Banking Already? We can't talk about full-scale replacement in this situation. Fintech is capable of magnificent things, and even the most significant industry players are noticing those. At the moment, it's all about the big banks and other financial institutions buying and using certain fintech startups, and that is by no means a replacement of the entire industry. More like a guerilla war for progress within the company upon acquisition. A war, that slowly shifts in favor of fintech. As a driving force of evolution within the industry, fintech has produced excellent results already. Let's delve into the matter and see which areas are already being heavily influenced by the up-and-coming tech visionaries and startups. Fingerprint scan is by far the most common thing on the market, as many middle-class or lower-budget smartphones already include this function. The latest iterations of Apple’s iPhones, Samsung’s Galaxy S9s and a range of Chinese devices are already capable of scanning user’s face and/or eyes to prove the identity. Forrester survey reveals that 61% of Singaporean financial institutions have already incorporated biometrics, such as fingerprints, iris and voice scan. Fintech has gone even further. PayPal, an innovative startup, originally co-founded by Elon Musk is calling iris scans “too old” already. The company offers silicone chips that go beneath the user’s skin. These chips scan the parameters like glucose level, vein patterns, heartbeat and more to provide multi-factor authentication for any activity that requires additional security. The blockchain is still inevitably associated with cryptocurrency by most people. Something so digital that it may seem like it's not going to impact their lives for decades is already useful within the financial sector. The blockchain is a sophisticated technology that has many sides to it, each solving different challenges. Blockchain ledgers are very good at storing, managing and extracting information. Imagine being an analyst at a legacy bank and you need to come up with reports on deposits withdrawal based on country, state or age of the client. Tons of work and hours of tinkering would be the least of your problems. Blockchain allows easier access and enables one to bypass the sourcing stage. You extract the info you need and get straight to analysis. Transaction speed and fees are other aspects that blockchain is set to fix. Guys at Circle, a 2014 Blockchain startup, are already offering fees that are close to zero as well as insane accessibility (like using a chat app to transfer funds) to transfer cryptocurrency along with usual fiat money (USD, EUR, GBP, etc.). Goldman Sachs, among many others, was quick to react to the opportunity and Circle received around $128 million in private funding. We're talking about a level of success that disrupted not only the traditional banking but most of fintech as well. The reaction to the disruption is standard: the big fish noticed the tech and funded it for their gains. Circle was not going to threaten large banks for the foreseeable future, but their tech adopted by other banks might have done just that. 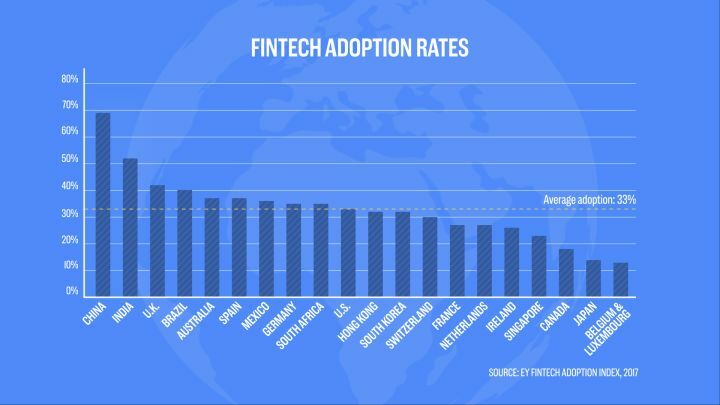 The other indicator that the banks are instead evolving with fintech and not being plain replaced by it is the technology adoption rate. The Blockchain report by Grand View Research highlights how the tech became common for the last few years and shows the forecasts for the near future. The purple color highlights financial services, and their share outweighs all of the others combined. Banks, insurers and so forth are using fintech to adapt to the new demands, that include speed, security and data management, all in one bottle named "Blockchain." Despite the big name, fintech is not solely about technology (completely weird, but bear with us). The era of new digital solutions that automate processes on each level and decrease the efforts required from the users has brought a new mentality to the game. There’s a story about grumpy representatives of heating services that would knock on your door at 7 a.m. and leave you no choice but to let them in for an inspection. It all changed when smiley agents that were selling boilers showed up. Their warm attitude and client-centric approach secured them tons of deals just because of the client satisfaction after their meeting with the agents! The story is taking another iteration right now. In a world where individual needs of a client may not be 100% matched, guys with a million-dollar smile and a tech that fits in your smartphone steal the show. "Remember how you needed a 20-digit password to send a few bucks to your mom? Now scan the fingerprints, and you're all set." This is the new way to treat clients and fintech is excellent in utilizing it. Banks slowly realize that customers become more digital and just doing the job is not enough anymore. Everything has to be reliable, fast, and effortless for the customer. And you have to make them feel like they're part of a family and that you take care of them. The whole vibe of transparency and client-first mentality is at the core of new successful businesses, especially in finances. People would rather trust someone nice with their money, and that's the reality that legacy institutions are actively learning to cope with. The process is still breaking each minute, the implementation struggles a lot, yet the thing is on the move with fintech indirectly pulling strings. So, Will Fintech REPLACE Today’s Banking System With All Its Flaws? Nope. Today’s fintech is a buzzing community of great minds, gold diggers and exceptional engineers that shape the financial world. The industry comes up with new tech, solves new problems and makes people like them on a daily basis. In the end, however, the banking giants will splash the cash on the table, point their finger and take the most promising startups with them. Because money still sets up the play. But what fintech can do, is to stimulate the evolution of the banks that see potential in change. Legacy banks will still wall off if they miss the right moment to innovate, but the most cunning representatives will thrive and incorporate new startups with new technologies to stay in business and provide more value to the customers. We think that fintech is not capable of entirely replacing the industry, but it is capable of steering it into the way of innovation and let it evolve naturally to a sphere where frustration over money transfer time and fees, 20-digit passwords and manual management of petabytes of information will be just a shadow of a memory. __Looking for more information on FinTech and its impact on the industry? Check out the rest of our blog.